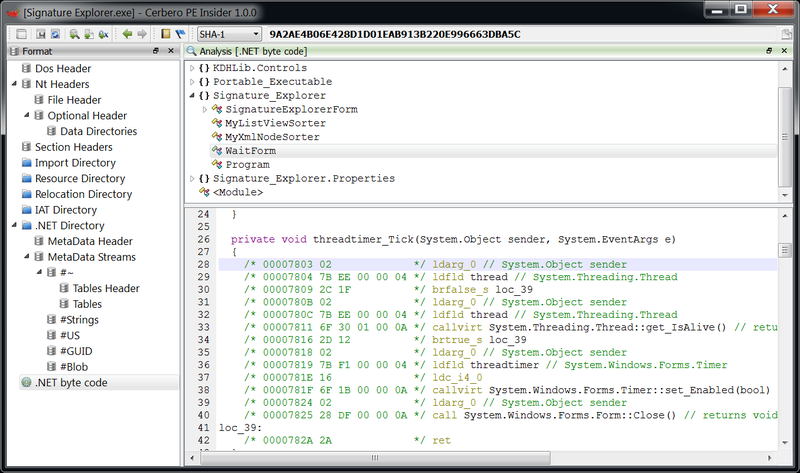 The utility clearly stands light-years away in terms of functionality compared to the Profiler, but it does have some things which go beyond the simple format inspection including MSIL disassembly, navigation, ranges and resource preview. Of course there’s room for improvement, but in the meantime here’s a first version. Enjoy! P.S. To keep up-to-date with news regarding this utility either subscribe to our twitter account or follow the blog. Just to say BIG thanks. PEI crash when I analyze an malware sample. [08/13/13,10:44:17] Install state for .NET Framework 1.0: not installed. [08/13/13,10:44:17] Install state for .NET Framework 1.1: not installed. [08/13/13,10:44:17] Install state for .NET Framework 2.0: installed with service pack 2. [08/13/13,10:44:17] Install state for .NET Framework 3.0: installed with service pack 2. [08/13/13,10:44:17] Install state for .NET Framework 3.5: installed with service pack 1. [08/13/13,10:44:17] Install state for .NET Framework 4 Client: installed with no service packs. [08/13/13,10:44:17] Install state for .NET Framework 4 Full: installed with no service packs. [08/13/13,10:44:17] Install state for .NET Framework 4.5: not installed. STRELiTZIA you caught a very serious bug which was introduced with the latest changes to the core in 0.9.7. To be specific the detach() method in CFFStruct was the culprit. Updated versions of the Profiler and PE Insider are already online. As bad as it is, be reassured that it had nothing to do with the malware, in fact it could happen with any other executable and it’s in no way exploitable, it’s was just a very difficult bug to catch triggered only under certain circumstances (that’s also why it didn’t show in our automatic tests). Thanks for the report, it has been extremely useful! It is normal, to get empty fields? Well, if there’s a problem in the PE file, then it is possible. However, we would need to see the original file to verify if that’s the case. You’re right, that was a bug… It’s actually a security measure, a check for recursion, but it had a bug and hence this problem. Updated version is online, thanks for the report! Awesome! always appreciate the quality of your work Daniel. One minor thing, the setup does not place an entry to the tool either in start menu or a desktop icon at all. Was this on purpose? Hi, Thanks for awesome tool, Please add to context menu for easy open files. are there any plans to add editing ? Not for the near future, but it’s not to be excluded that it will be possible eventually.